I’ve even created a helpful free printable to get you started on your own journey! I will always begin in pencil so that I can erase and alter my hand lettering until it is perfect, and THEN I set in with a Micron pen. You begin creating beautiful hand lettering by copying others. Does that sound weird? When I initially began copying other people’s hand lettered art, it felt like I was stealing from them. It just felt wrong. Then I realized, I’m not stealing, I’m being inspired! Stealing requires that I take something away from the other person and I’m not, I’m actually complimenting them. One of the biggest reasons it is so important to look for inspiration to copy when it comes to hand lettering is because initially, your brain isn’t trained to think in the concept of hand lettered art and fancy fonts. 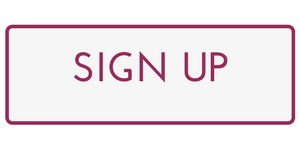 It needs a foundation so that you can begin building your own hand lettered style. Back in High School, I wanted to become a Spanish teacher and I poured my time into learning the language. By the time I hit Junior year, I started having dreams in Spanish. At that point, I knew my brain was beginning to understand the concepts of the language. In Bible terms, my brain was being “renewed” to the Spanish language. Art is the same way. You need to see and try examples so that your brain can play with the idea while you AREN’T thinking about it. Before you can begin to generate your own hand lettered art ideas, your brain needs a foundation to build on. You will only get that foundation by looking at inspiration. 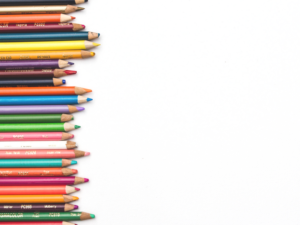 You won’t have to wait until you start dreaming about art to begin creating your own ideas, but when you fill your mind with examples, I think you’ll be surprised by how quickly ideas and dreams come. 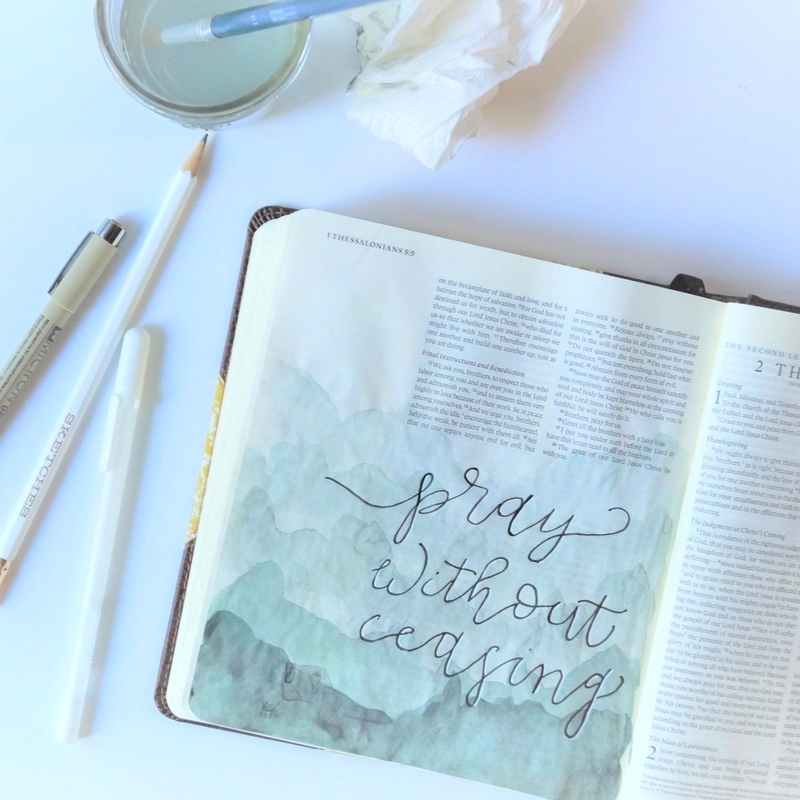 Something that will help you strengthen this foundation is practicing. And you’re going to hear this in every single article you read about hand lettering art: you must practice! Much of this is tied into muscle memory and training your eyes. 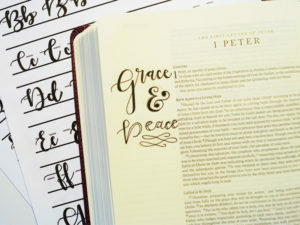 Now that I have been hand lettering in wedding Bibles for a while, I need my guiding aides less because my eyes can predict where the swirlies will look best and my hand is now trained to execute them more fluidly. But that has only come after years of hand lettering names, wedding dates, and verses. How much practice you need will depend on where you begin in your journey. 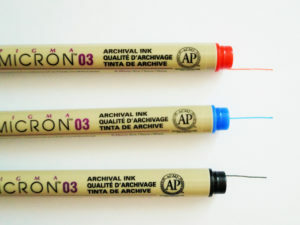 If you start with gnarly chicken scratch like I did, you may need to invest an hour or two a week to see some improvement. 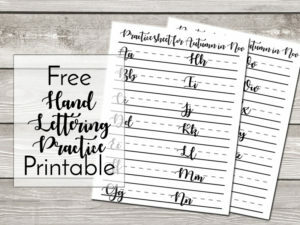 For this very purpose, I’ve created hand lettering practice worksheets that you can download as many times as you need after they have been purchased. 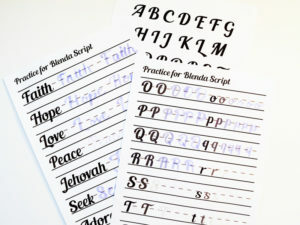 View them in the Printables section by clicking here. In the video game world, you never battle the “big boss” right away. You face little battles and smaller bosses first. Eventually, you work your way up to fighting and defeating the big boss. Hand lettering is the same way: you don’t take on an intricate font without experience and expect to execute it well! The world of Instagram is very UNHELPFUL in this sense. If you watch any in-process videos, you may be deceived by how long it takes to hand letter a single word well. As a frequent poster on Instagram (@movethemountains), I know when I share a video, I am limited to 60 seconds but I also know it is going to take me longer than that to letter a single word. So, what do I do? I speed the video up. Even if you are watching a well trained calligrapher, it is possible that the video is sped up a bit. Also, you have probably NOT watched them warm up, you may not know how many takes it took them to create that 1 video, you probably don’t know for how long they have been lettering! There are a lot of unknowns when you watch others create their hand lettered masterpieces and it is important that you have the proper expectations for yourself. 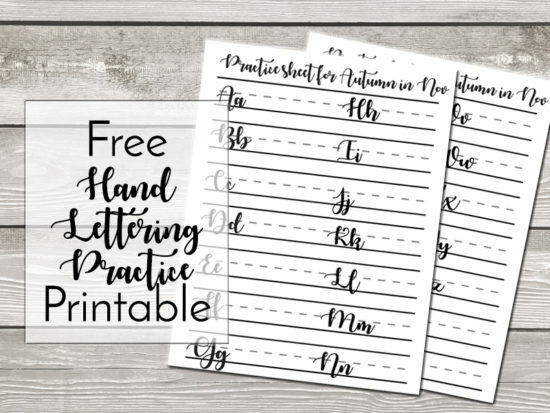 Right now, my favorite font to copy is the Lemons Mangos Sunshine font I have in my hand lettering worksheets: click here to see it! Recently, I was talking with an artist friend who sees me work a lot and he told me to “Keep your eyes like mud”. I was like, “Ummm…what?” He went on to explain how eyesight is fluid and if you look at one thing too long, your mud will dry and you’ll be stuck. 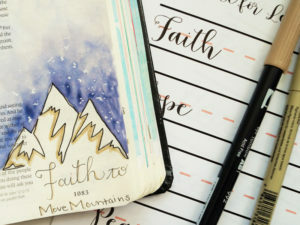 If you’ve worked on a Bible journaling page for an extended period of time and have gotten nowhere, you’ve experienced your mud drying. Now that I have been doing art for a while, I totally catch myself getting stuck like this because I find satisfaction in completing a task. I just want to finish it but if I don’t give myself space away from the art, I will literally want to bang my head against the wall! So I’ve taught myself to walk away and try again later. 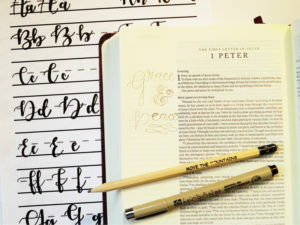 Now, that I have covered some of the basics to begin creating beautiful hand lettering in your journaling Bible, are you ready to reinforce that foundation through practice? Download the free printable I have created for you below!